I want to use CXTPSyntaxEditCtrl in dialog. Quote Reply Topic: I want to use CXTPSyntaxEditCtrl in dialog. Is there no view and no doc? If so, how do I implement it? However, the above problem occurred. It becomes strange when input. Some of the Codejock classes support dialog usage through custom controls in the VS dialog editor. For example, if you look at XTPReportDefines.h, you will see "const TCHAR XTTPREPORTCTRL_CLASSNAME = _T("XTPReport");" You can add a Custom Control to a dialog, then give it the class name of "XTPReport" and a style of 0x56010000, create a variable, and have a report control in a dialog. The Syntax Editor also has some #defines, one being "const TCHAR XTP_EDIT_CLASSNAME_EDITCTRL = _T("CodejockSyntaxEditor");" Though I have not tried it, I suspect you could add a Custom Control of class "CodejockSyntaxEditor" to your dialog template and include any other Syntax Editor supporting classes you need to have the editor run in a dialog. 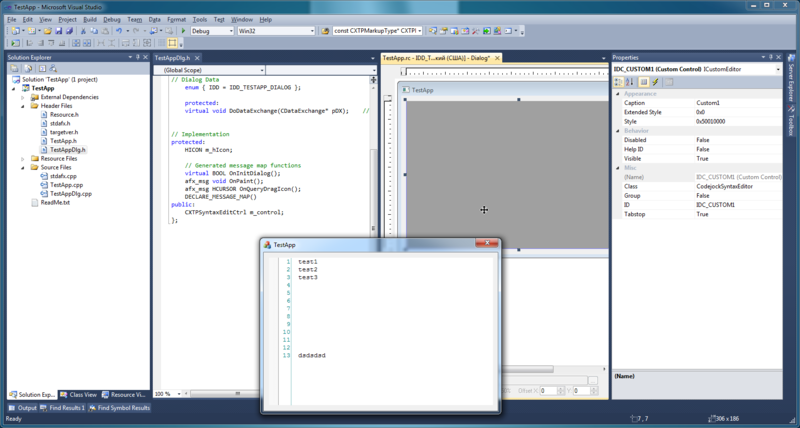 Another alternative is to use CreateWindowEx() and do dynamic window creation. I've tested CXTPSyntaxEditCtrl which used with CDialog and I not found any problems. May be you set wrong settings of custom control. See screecshot.